Of course I had to be all about ice cream, especially with summer finally choosing to grace us with it’s presence in Oregon. But summer and playing outside is distracting us from our crafts, so we only did half of them this week. That’s okay we still had fun! I will post the crafts on Saturdays so you can use the weekend to get any supplies that you may need. We are making our way through the alphabet this year so if you missed a letter you can find it here. 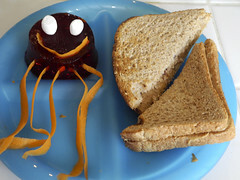 J is for Jiggly Jellyfish – Jello, marshmallows, and carrot make up this adorable snack. I actually just used the premade cups, cut the jello in half to make them a little flatter and decorated. The boys loved these! Oh and if you use the premade jello clean the cups and save them for the Flying Jellyfish craft! Jellyfish Dogs – I know a second food related craft, but can you blame me these are so cool! 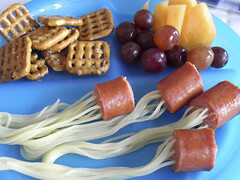 You just stick the speghetti into the hot dogs and cook following the pasta directions! Easy peasy & tons of fun! Flying Jellyfish – Another craft that I totally failed at. I recommend putting the hole in the cup before having Zane decorate them. When I tried putting the hole in the glue didn’t hold to the plastic so kind of destroyed the craft. And I was so excited because cutting the yarn would have been a really good scissors practicing activity. Jellyfish Invasion – We didn’t make it to this craft, for one rare week I didn’t have tons of produce bags this week. Oh well, I still think these turn out really neat! 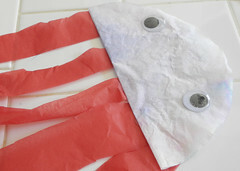 Coffee Filter Jellyfish – Both boys had fun creating their jellyfish and this is such an easy laid back craft. This is also a great toddler craft! Hey these craft work is really wonderful, I really loved the creativity used and the colour combos are really excellent. I shall book mark this blog and stay in touch.